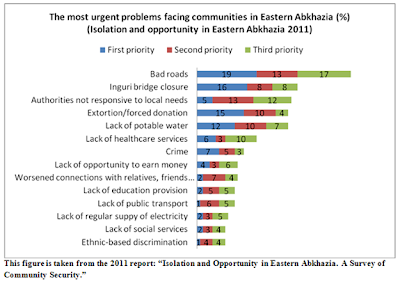 People living in Eastern Abkhazia view bad roads (49%) as the most urgent problem facing the area. According to the report, roads in Eastern Abkhazia have not undergone renovation since conflict in the 1990s, with some exceptions. Consequently, this has created a feeling of isolation, particularly among people residing in villages located far from towns. The second most urgent problem is the closure of the Inguri bridge, mentioned by 32% of respondents. While the first two issues highlight insufficient or poor quality transportation connections, the following three problems refer to concerns about the unresponsiveness of authorities, extortion and lack of potable water. Ethnicity-based discrimination (9%) was the lowest-rated result for this question. The second aspect is perceptions of personal safety and the role of security actors. Overall, people do not feel their physical security threatened, but they report a wide range of security incidents such as agricultural theft, robbery and gunshots. Also, about a third of respondents (33%) prefer to rely on relatives and friends or no one (26%) for protection, and 10% of people answered that their local government is responsible for protecting them. Apart from individual security, a majority of respondents (80%) do not expect to see a deterioration of the overall security situation. However, there are concerns about possible triggers that may increase tensions or renew the conflict. 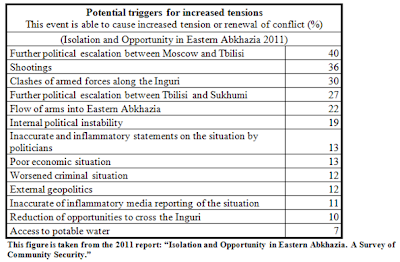 For example, 40% of respondents consider that further political escalation between Moscow and Tbilisi may increase tensions or renew the conflict, while shootings (36%) or clashes between armed forces along the Inguri river (30%) are considered to be possible triggers for increased tensions. Additionally, 27% of the surveyed population thinks that further escalation between Tbilisi and Sukhumi may increase tensions or renew the conflict. According to the report, hostilities and mistrust between ethnic groups in Eastern Abkhazia are low. People are also supportive of any measure to increase the level of contact. While 9% reports mistrust towards other ethnic groups, no respondents noticed any “open hostility”. Over half of people (60%) in Eastern Abkhazia maintain contact with people from other ethnic groups. 28% of people report friendships with people from different ethnicities. This figure is 21% for family ties and 11% for trade and business relations. However, 29% of respondents have no relation with individuals from other ethnic groups. In addition, half of those interviewed remarked that the protection of human rights would build trust and confidence with other ethnic groups. This is followed by 21% of respondents who believe this could be accomplished by creating community-level mechanisms to resolve local disputes and 18% who think a better economic situation will achieve the same goal. This is not a survey undertaken by CRRC, thus we cannot comment on methodology or other aspects of the undertaking. However, we did want to highlight this survey as relevant material that may be of interest. You find a link to the publication here.